How to let dinosaur come back? When we were little kids or now we are adults, we watch lots of dinosaur movies and cartoons such as Jurassic Park directed by Steven Spielberg and Ice age: dawn of the dinosaurs produced by Blue Sky studios. 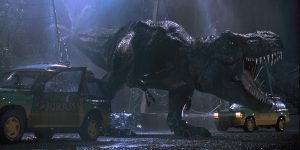 In these movies or cartoons, dinosaurs are created by high-tech synthesis technology via computers. In my view, dinosaurs are giant and fierce. I only want to see them in virtual world rather than real life. However, some scientists are working on dinosaurs return and start at chicken modification. This idea looks like 100% impossible and stupid! can we create dinosaurs via colon technique? A scientist and dinosaur digger, Jack Horner, he had a crazy idea and he has already spent his whole career to realize it. When he was young, he wanted to be a dinosaur paleontologist and even have a dinosaur as pet. At the beginning of his career, he and his colleagues found lots of dinosaur skeletons and fossils. We know we can create new life by colon technique if we can obtain their DNA. Jack told a joke about this. If we can find a mosquito which sucked dinosaur’s blood, we may collect DNA from them and colon DNA at lab and then a little baby dinosaur comes out. This is impossible.Where you can find mosquito sucked dinosaur’s blood? They also did lots of lab work to prove this is wrong, because they can collect blood vessels and other materials from dinosaurs except for DNA. 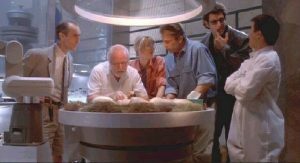 They stated this that DNA was broken easily and fast.Therefore, Jack’s team choose another way to rebuilt dinosaurs. Imaged dinosaur creation by colon technology. The credits from Google. Why they chose chicken as the start? Scientists classify birds like chicken as dinosaurs and you cannot argue with this because this is true. However, for ordinary people, we cannot accept this definition, because dinosaurs are huge and strong. When we look at chicken, we just want to ask. Are you kidding me ? In fact, if we calm down and analyse some behaviours of dinosaurs, we may find relationship between dinosaurs and chicken. For example, dinosaurs build nest and some of them can fly like birds. Additionally, they raised up their babies like birds. This evidence shows evolutionary shift from dinosaurs to chicken. Firstly, they tried to create chicken with teeth. For this step, they used atavism technology to make chicken with teeth. This technology aims to regenerate previous missed part. For this case, they collected tooth gene and produced it in chicken. The chicken now has a closer characteristic to dinosaur. Next, they looked at embryos of chicken and they found their hands have three fingers and three digits, which is very similar to a kind of dinosaurs’ hands, ie Archaeopteryx. In evolutionary, one of gene in chicken turns on and this leads to fusing of hands. They assumed if they can stop gene turning on, they may get chicken with three-fingered hands. Finally, they focused on chicken’s tails. Dinosaurs have long tails, but we hardly see chicken’s tail which is not obviously. The main cause is that another gene of chicken leads to tail resorbing. Similarly, if they can prevent tail resorbing, we may get chickenosaurs. Modification of chicken to dinosaurs. The image credits from Tom Mendelsohn. Recently, Jack published a book named ‘How to build a dinosaur’, I am really interested in this and I really want to recommend his video on Ted to you. This is very funny, educational and meaningful! Can you imagine a dinosaur in our life in future? To be honest, I do not want this come true.